If those girls are not hired models, i would have killed for taking their pictures from THIS angle. 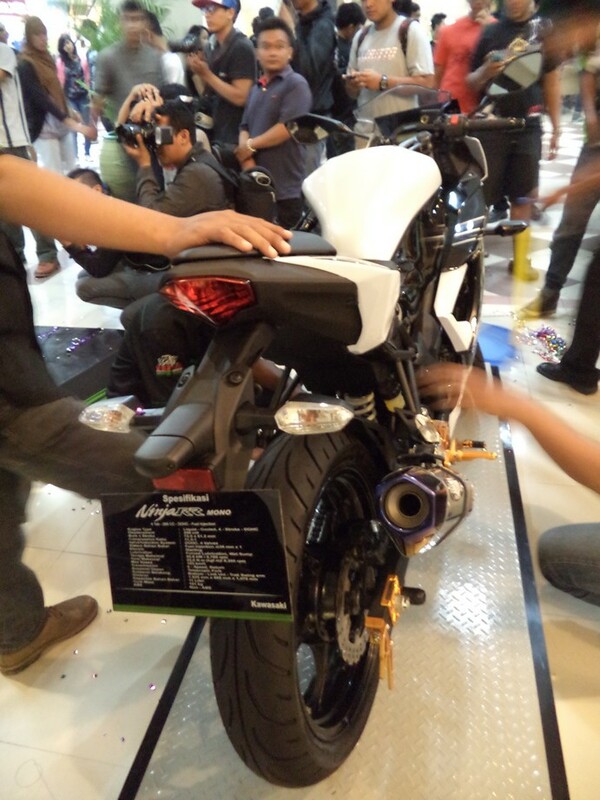 It was a busy night that i had a chance to pay a visit to the launching of Kawasaki’s newest bikes. Actually, two newest bike. Yeah, it’s not surprising that the ceremonial launch gets a little bit late compared to other region especially Jakarta, but well, what would you expect? Yesterday’s night, Jackalride comes along with Reka (Lovemotobike), Irfan (Pertamax7), and Dipo (Aluvimoto) to get some hottest release right at the “crime scene”. And the release was hot, the salesgirls actually are 😉 It was a rightful decision to come, haha. Actually i came a little bit late, ya know. It was late that Lek Dipo and Lek Ipan already taking pictures when i came, so a little bit sorry here.. So, what’s my impression about these motorcycles? 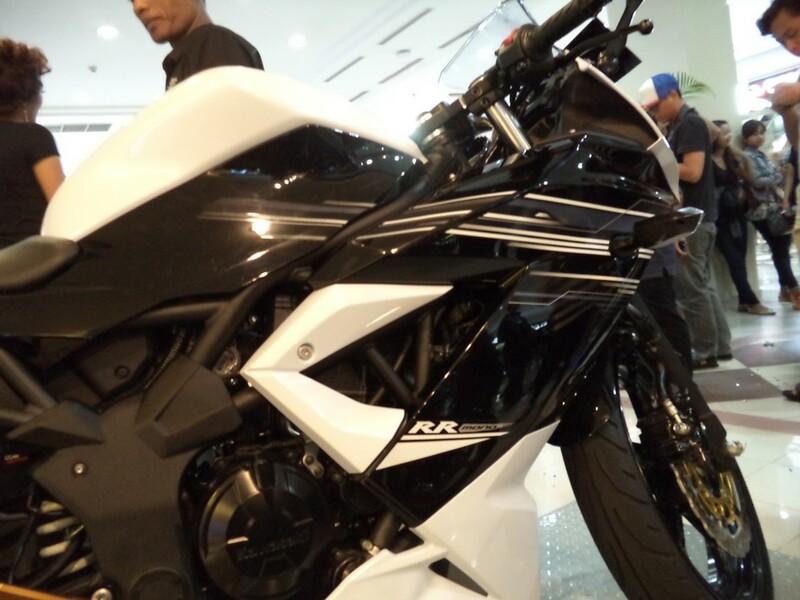 This bike’s a little bit slimmer than it’s older brother Ninja 250 double cylinder, more racy aura, it’s riding position is also somewhat geared toward racing purposes, AND form it’s appearance, proved that this bike would pack quite a punch if tested. Sadly, we don’t have that chance and they (the dealer) won’t let us do so. 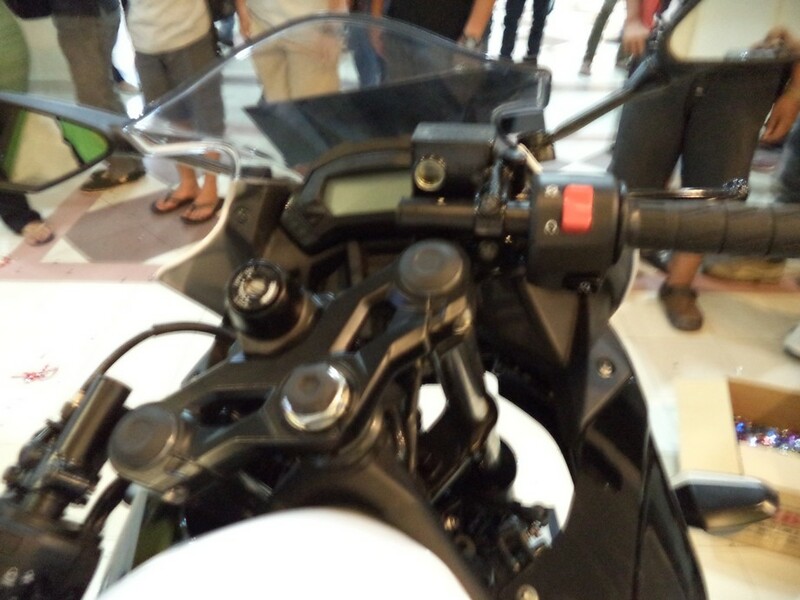 It feels bad when you come to a motorcycle release event and you don’t even get a chance to try it, i think AHM and YIMM are ahead of this. 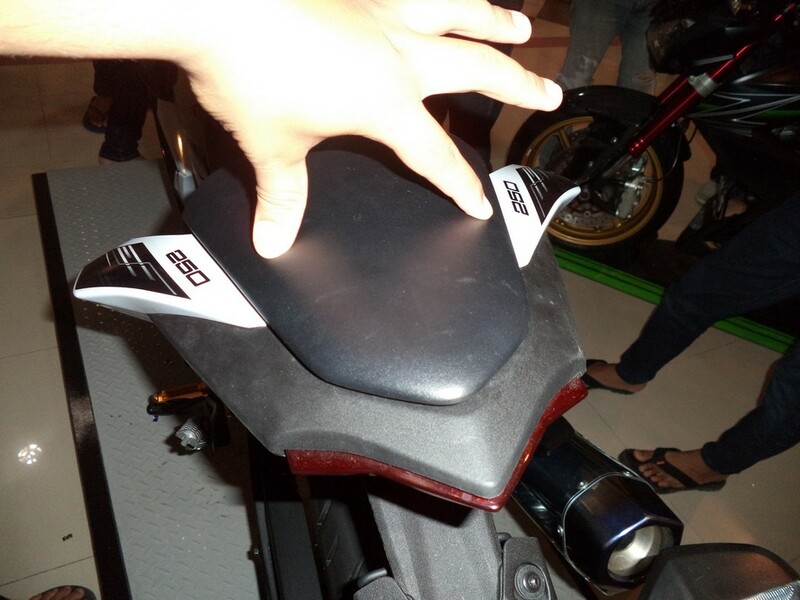 What a waste not to display the power of KLX250-based engine on this buddies. Oh yeah, the Ninja Mono displayed is NOT standard! Dunno what they want from doing this, but this ruins the mood. It is modified mostly using the Nasser-Beet components. About comfortability, which has been the most aspect i always focused on, this Ninja Mono is racy, the seat and riding position is racy, i think this racing position should be aplied to Ninja 250 dual-cylinder instead, vice versa, because this Mono, yields lower power and thus lower speed and it IS claimed to be used at the purpose of normal usage, not racing. 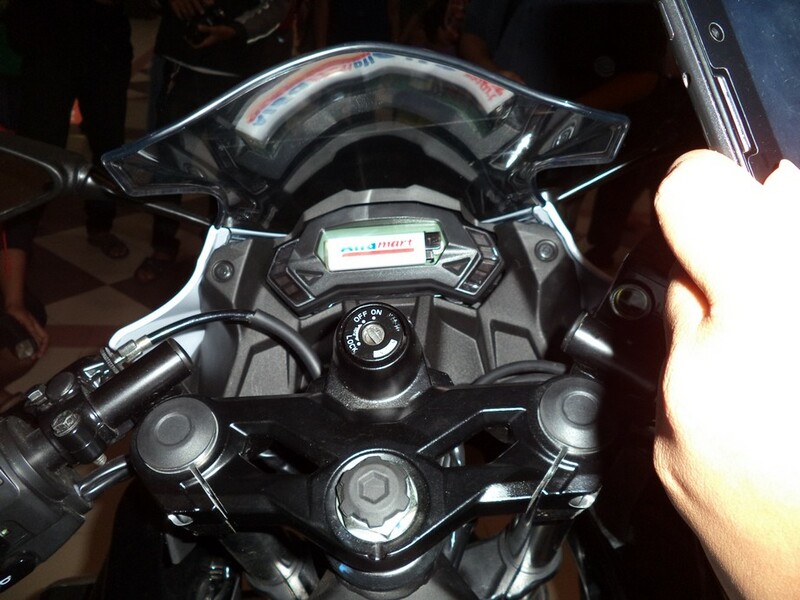 The speedometer is small enough to be compared with pocket matches. 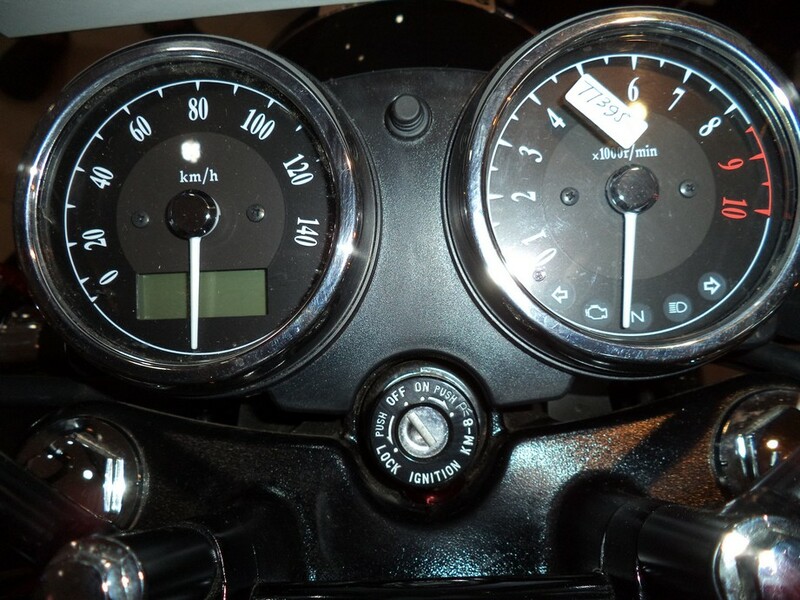 At last, the speedometer is a little bit small, and it IS small! So small, that it even fits digital tachometer and speedometer into one small display, which is NOT so good, thus harder to monitor. That’s it. Actually, i’ve been longing to see this bike instead of Mono. So, what would we have here? The chrome coating is so good. One of the thing i was aware of is it’s chrome coating, and it looks luxurious indeed. The coating was good, really good if i could say it, plus the weld was done beautifully compared to other brand at this segment. You could say that this build quality is a little bit special, but not that special that it could be priced for Rp.69.900.000. It is indeed overpriced. 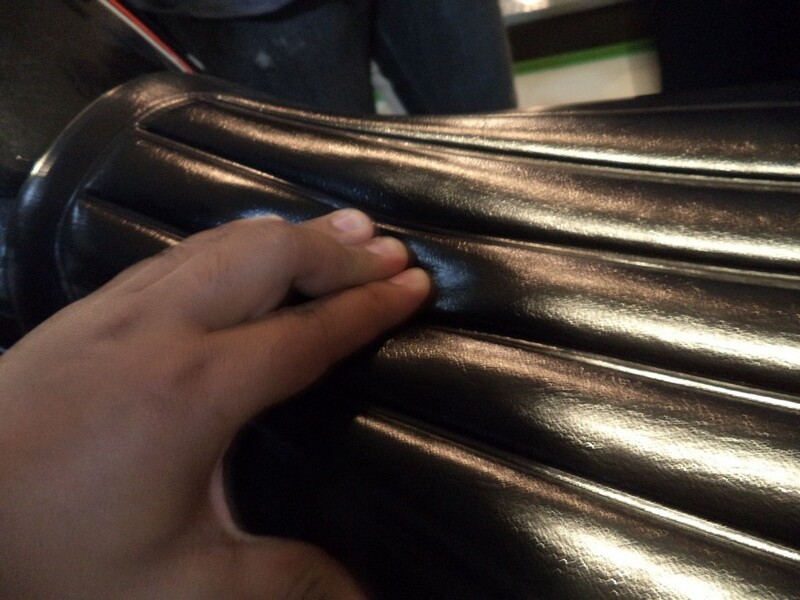 when you tried to rub the seat.. It plumped in. Next, the seat was actually, comfortable. Like the older Japstyle bikes, it’s seat is comfortable and soft. I could say that this bike is geared toward long-distance touring or daily activity, so high top speed is not required. Hey, waht would you expect from a bike that makes you sit like watching movies with popcorn on your hands? Top speed isn’t everything, isn’t it? Is the model included in that 70 million price? So, have you decided which to buy? Oh yeah, almost forgot about this bonus.